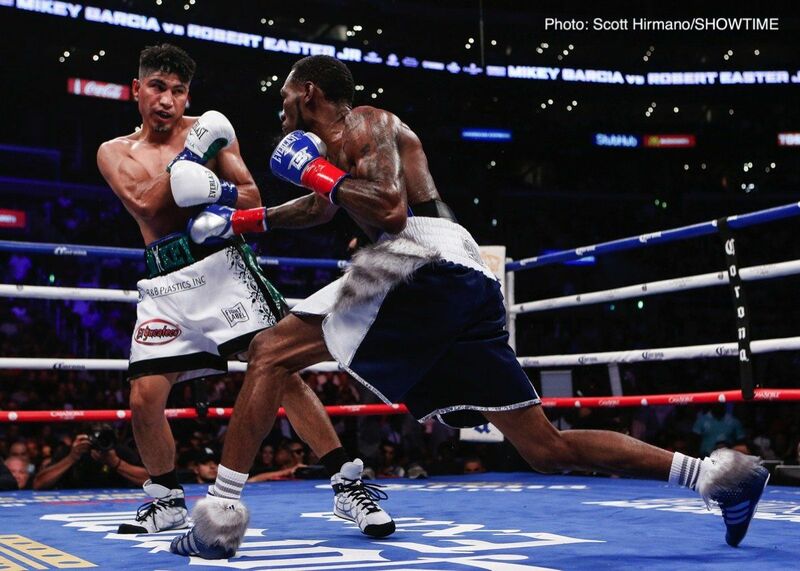 Robert Easter, Jr. proved not to be much of a challenge for Mikey Garcia. Easter, based on recent comments, might interpret his poor showing as resulting from a lack of experience. Moreover, many boxing media will attribute it to Garcia’s boxing skills. At the elite level, a boxer must possess physical attributes that allow him to be competitive: good chin, good power, good endurance, good…, good… Not great, just good enough to be respected in every department. Easter lost, not because of his lack of technical ability, but because his power was not effective in keeping Garcia off of him. It is not enough for a “pure” boxer to work a jab, as Easter attempted. The jab must be doing damage, or it must set up other punches that do damage. The most recent example of a jabber getting pummeled was when Andre Dirrel fought Jose Uzcategui this past March. Relying solely on a jab to maintain distance is not acceptable at the elite level of competition. All Easter had to do was demonstrate to Garcia that he had the power to hurt him and the full twelve rounds could have looked more like the first round, in which Easter controlled distance with his jab because Garcia had yet to gauge his power. This was Easter’s only really good round. He outworked Garcia with his jab and kept the distance. A few times, Easter missed with right hands following his jab. So early, it was not necessary to attempt to reveal his power as Garcia was not taking any risks. Easter did a good job in not working more than what was necessary to win the round. Already the fight became competitive. Garcia was repeatedly coming close to Easter’s chin with his straight right hand and it appeared that he would put Easter down with it at some point, for punches cannot keep coming that close without connecting at some point. This round was the time for Easter to authoritatively land something other than a jab. Garcia has not fully closed the distance as he was reaching wide with left hooks – that Easter failed to counter with right hands. It was completely irresponsible and overaggressive how much Garcia was reaching with his left hook. As expected, Easter went down from a 1-2-3 (jab, straight right, left hook) combination. Garcia closed the distance with the jab, the straight right was right on the chin and forced Easter off balance, and the left hook landed while Easter did not have proper balance. It was not clear how much Easter was hurt but he held Garcia to squelch his momentum. Luckily there were only 23 seconds left at the time of the knockdown. It was a wrap at this point. Easter was not able to maintain distance. Garcia was literally pushing Easter with a quasi-jab and landing left and right hooks around Easter’s high guard...while in the center of the ring where Easter should have been more effective in using his range. Even when Easter fully blocked Garcia’s punches, he was still stumbling around due to his poor balance. From which we now see why Easter “gives up his height.” Similar to heavyweight Deontay Wilder, it is my opinion that both use a wide stance to compensate for their poor balance and to ground themselves when they throw their power punches. There is this weird thing where humans instinctively do what feels more comfortable to them: if it looks bad kinesthetically, then it is probably a compensation for something else. Everything starts with the feet and good balance. With his poor balance, Easter is slow to initiate his punches because he is never really ready at any moment. Whether it be Garcia, Lomachenko, or Floyd Mayweather, all these fighters who seemed to be able to improvise on the fly, all have good balance and coordination. Now back to Easter only throwing a jab: anything else would have challenged his ability to maintain good balance and get back to a proper defensive position. Easter simply cannot pivot well enough to lead or check with a left hook as he moves out of the way. He also cannot pivot quickly enough to throw a good left hook to the solar plexus. Throughout the fight, it appeared to me that Easter was squaring his shoulders and angling his lead forearm as if he were cocking a check left hook. That in itself would discourage use of the straight right hand as it would be thrown with less leverage from that position. In other words, rather than a wide stance and pre-setting himself for left hook, Easter needed a narrower stance and more side-angled torso that facilitated maximum rotation and torque for his straight right hand. Terence Crawford does this well in the southpaw stance and it enables Crawford put his lead hand as a guard in between himself and his opponent. Crawford would then jab over the lead hand of his opponent and force his opponent to reach to get to him. 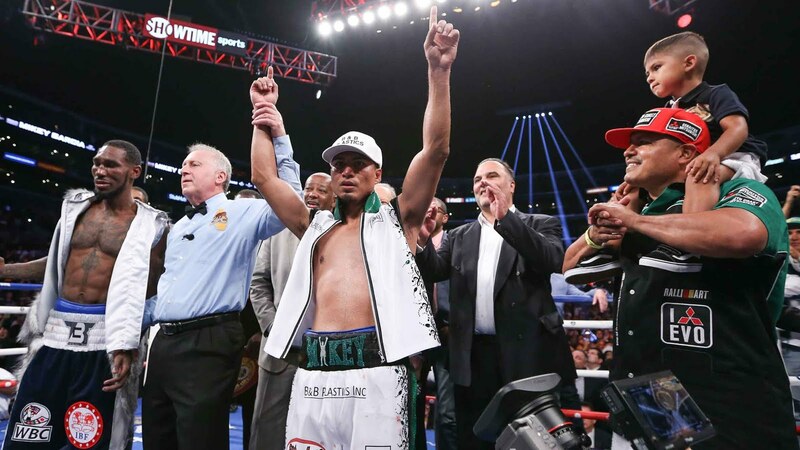 Mikey Garcia is still entertaining the ludicrous notion of challenging Errol Spence, Jr. at welterweight since Top Rank seems to be avoiding having him in the ring with Vasyl Lomachenko. Damn corporate capitalists in the sport of boxing making money for themselves. 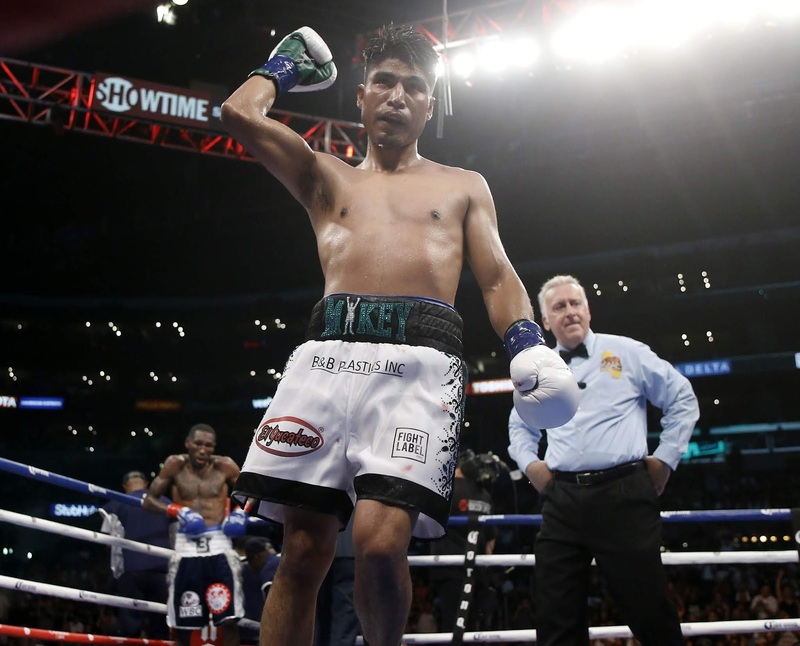 Mikey Garcia defeats Robert Easter Jr. at Staples Center in Los Angeles, CA.